Looks like the iPhoto engineers have been having coffee with the Aperture guys. iPhoto 6 has not only adopted Aperture's full screen editing mode, but you can "compare" up to eight images onscreen at once while doing so. Clearly, iPhoto is becoming one of the premier consumer apps on the Mac platform. In full screen mode, you can view your images without the distractions of the user interface, enabling you to concentrate on the image itself. If you want to edit the picture, activate the Adjust palette (Apple did not rename it the Heads Up Display as in Aperture) and tweak brightness, contrast, temperature, etc. And if you're not sure which image in a series is the best, put it along side your initial favorite in full screen mode and compare it. Once you figure out which one is the best, mark it as a favorite. 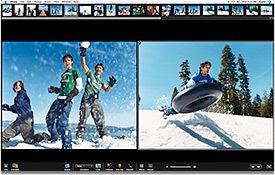 When you consider that you also get One-Click Effects, Photocasting, greeting cards, calendars, RSS publishing via iWeb, and a performance boost, iPhoto 6 seems like the deal of the year. How much does it cost? Only $79. Oh, did I mention that you also get iMovie HD, iDVD, GarageBand, and iWeb? Yup, still $79 for the whole collection. Apple calls the package iLife '06. You can buy iLife '06 right now at the Apple Store. Shipping is free.